Like houses and malls, people want to be a website whose design is current and appealing. There are designs that will put off visitors automatically. These designs are at times hard to read and make the presentation of your content less appealing. When given an option, visitors will abandon and leave your website for another. Update the design of your website to provide room for new plugins and attractive features. Avoid templates that are generic and fail to provide you with a chance to customize your page. Internet readers have a lower concentration span than people who read books. Your digital marketing strategy will fail if the content on your website proves difficult to read. Draft content that is simple, clear and precise. It should be relevant to the subject of your website. The presentation of content on your website should be in the best format possible. This calls for simple sentences, headings, and subheadings. Use bullets and numbers to make it easier to follow your story. Where proses are used, make the sentences and paragraphs simple. Readers want to extract information as fast as possible. If the content is presented haphazardly, finding relevant information will be a huge challenge. It is difficult to tell advertisers that you do not need their money. However, do not prioritize the need to advertisers over the needs of your readers. Make a decision to restrict the number of ads to avoid overwhelming your readers. Too many ads will crowd a page and make it difficult for a reader to focus on the content of your article. It gets worse when the ads pop up over content and the visitor has no control over what to do with these ads. Restrict these ads to maintain traffic over time. Auto-play videos are a real turn-off. Visitors may feel that you are forcing them to consume content and ads that are not even relevant to their needs. Visitors should have the right to click on videos that they deem relevant to them. Some videos have their controls hidden. This means that the visitor does not have control over when to stop the video or control the volume, on screen size and such other elements. Work with specialist SEO services to develop a strategy for videos that will work for your clients. Do not abandon videos, because, they remain the most interactive way to communicate with clients. It is common to ask visitors to provide personal information for your marketing strategies. However, you cannot force them to provide this information. Asking for information should be a natural act that is also voluntary. Forcing visitors to register will prompt them to abandon your page. Conversion rate experts recommend an optional registration process. This is one where the visitor has a choice to register if they want. In case it is mandatory to register, there must be benefits accrued from the registration. They could include receiving a newsletter, future recognition and low prices, or other such offers. 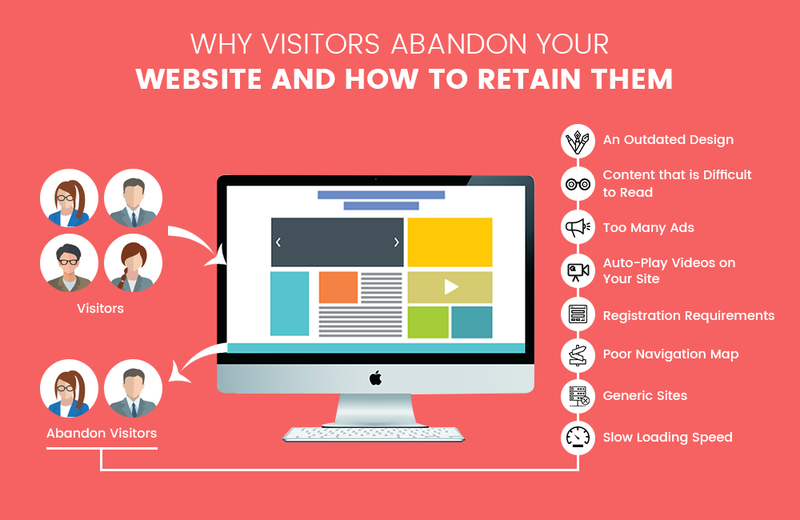 Beyond abandoning your site, visitors will not return if they find hindrances while navigating. Every website should have a reception desk. The reception area helps the visitor find their way around your website. Once they land on a page, it should be easy for them to find information that they need. This information may be present on pages like those for services, sales, news, trends and the contact us page among others. There are pages that should be easy to find like those that provide information about services, your website, and business and your contact information. If a customer finds it difficult to locate information or pages they need, he or she will never return to your site. The best digital marketing strategy is to develop an effective navigation map that simplifies access to information on your website. Create a map at the initial landing page from where visitors can access pages with a single click. Branding is as important online as in the real world. A website needs to have a personality. Improper branding affects the perception visitors have of your brand. They are looking for a website that looks like the brand they know. Visitors expect High-end brands to have sophisticated websites. Experts in SEO services will help you develop a website that projects your brand perfectly. Such a website uses images and colors that are familiar to your customers. This makes it easy for them to identify the information and services you provide through your website. The character of a website can be determined by the categories of goods and services, pages available, colors, graphics, and overall experience, among other elements. Work with specialists to give your website a character that is similar to that of your brand. Slow page loading is an issue that will cause you to lose even the most loyal customers. The average waiting period for a website to load is usually two seconds. This should be both on a computer as well as on mobile. If the site fails to load within three seconds, most visitors will abandon it. Customer satisfaction falls with every second that they are forced to wait. According to conversion rate experts, optimizing the load speed of your web pages should be a priority for all website owners. Work with a web host who can guarantee excellent speeds. Do not use too many images and graphics as they can make your content heavy and cause it to load slowly. By improving the load speed of pages, you will retain most visitors that land on your site. There are many other reasons people abandon your website, some of which are unique to the site. Abandonment can and will slow down your digital marketing strategy. The secret is to work with seasoned SEO services to develop a website and strategy that will keep visitors to your site engaged for the longest time possible. The likelihood of visitors returning increases when they have a reason to spend more time on your website.